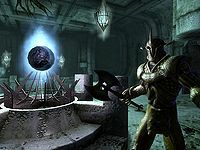 They will also found at Garlas Malatar during the quest Umaril the Unfeathered, and after completing the Knights of the Nine questline. 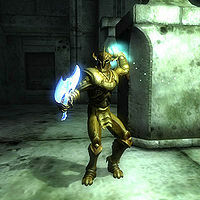 Weapons and Armor: They always carry an Ayleid Battle Axe, which has a leveled Shock Damage enchantment. Their armor cannot be looted. Light that Burns: Shock Damage accompanied by Light. The amount of damage is level dependent (varying from 1 pt for 10 secs to 6 pts for 10 secs). Light that Protects: a Shock Shield (magnitude varies from 10% to 30%). a leveled piece of jewelry. a leveled gem. This may include Welkynd Stones. Both Aurorans and Umaril the Unfeathered are based on the Xivilai's animations and body mesh. This page was last modified on 28 January 2019, at 20:51.